With Christmas rapidly approaching, most of us are entertaining more than ever. The one thing that you always want to avoid when entertaining is spending too much time in the kitchen! We have all been there at one point or the other; the guests are outside dining and drinking while you’re stuck in the kitchen trying to crank out dishes. The key is to make ahead as many dishes as possible and dessert is one of the easiet things to make ahead. A cheesecake is the perfect entertaining dessert because it can easily and should be made ahead. The best part is, it’s tastes better the day after and it’s very simple to make. Because it’s the holidays I made a Eggnog Cheesecake made with Philadelpia Cream Cheese that I picked up at Walmart. 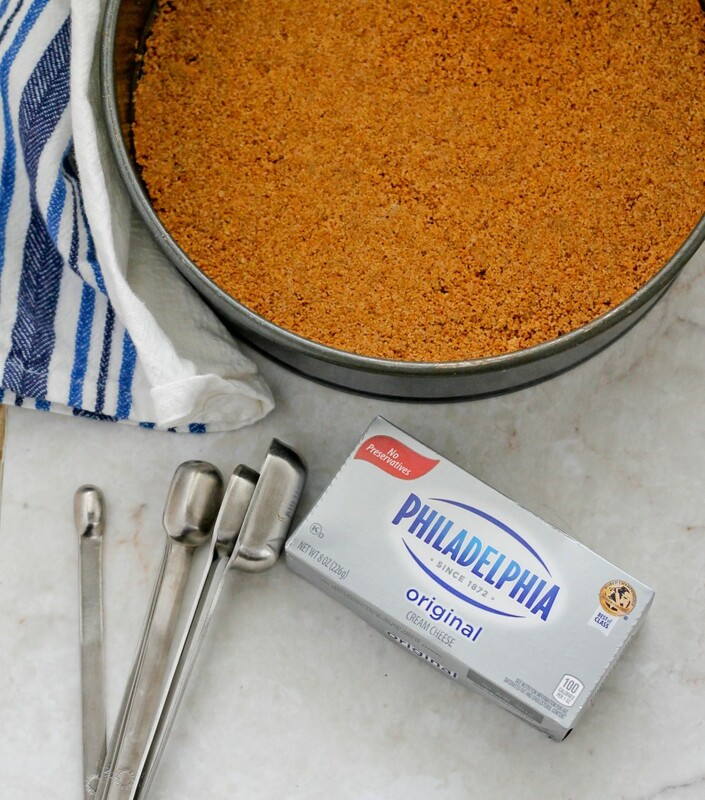 You can now save $1 on two packages of Philadelpia Cream Cheese from 12/13-2/13 so this would be the perfect time to make a cheesecake and stock up! I simplified this cheesecake recipe by not using a water bath; some cheesecake recipes require it while others don’t. Sometimes I bake the cheesecake in a water bath and sometimes I don’t, this time I didn’t and the cheesecake had a perfect velvetty texture. 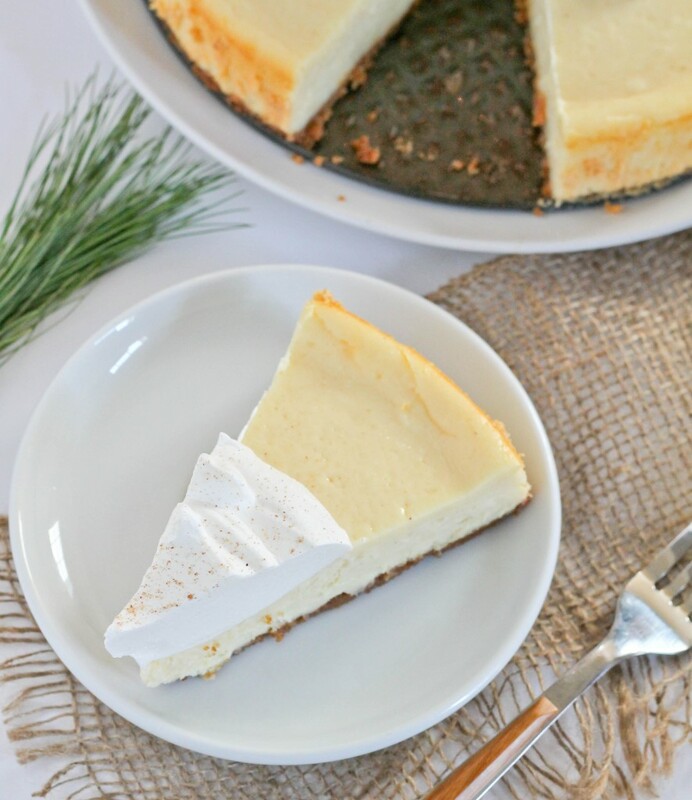 If you’re an eggnog fan this recipe is for you; even if you’re not an eggnog fan you will love the combination of spices that blended perfectly with the smooth cream cheese and buttery crust. I topped it with whipped cream and grated fresh nutmeg to give it an extra level of richness. I strongly recommend making this the day before and refrigerating overnight; top it with the whipped cream and nutmeg just before serving. How do you make entertaining easy? 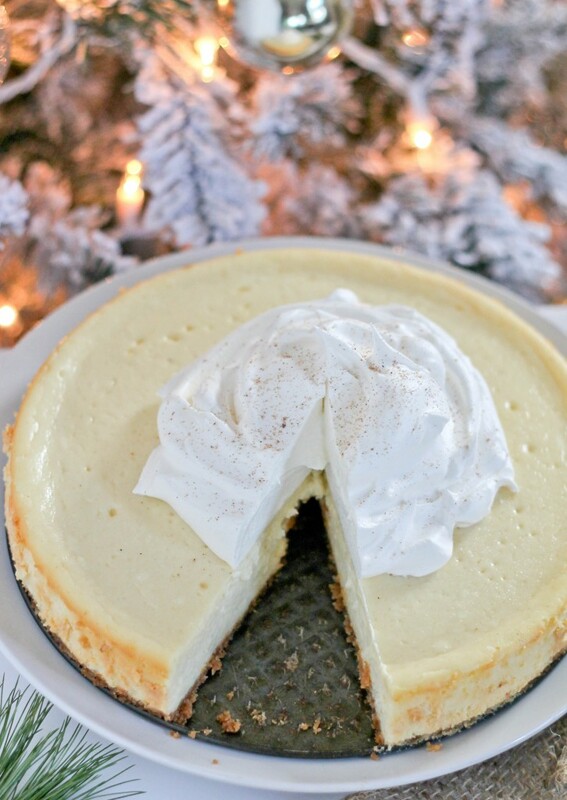 You can find more holiday recipes using Kraft products by clicking here. 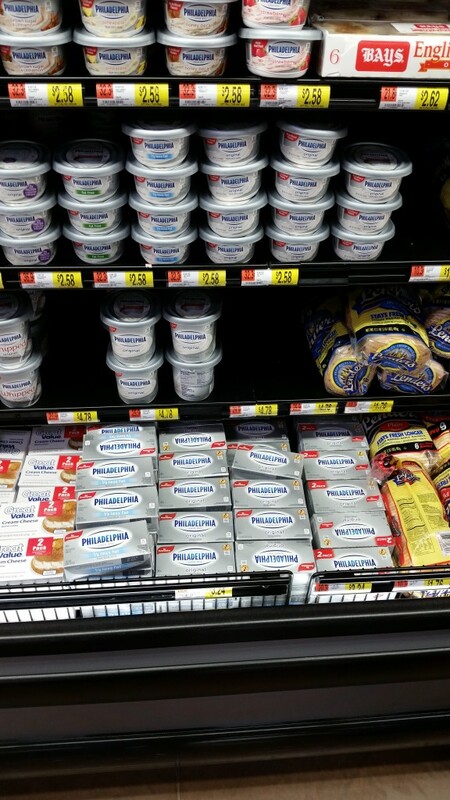 Look out for extra savings this season when purchasing Philadelpia Cream Cheese. Preheat oven to 325 degrees. MIx graham cracker crumbs, sugar and butter in a small bowl. Place into a 9 inch spring form pan and press to form a crust. Place into preheated oven and bake for 10 minutes. Remove from oven an allow to cool. In a large bowl add room temperature cream cheese and beat with a mixer on high until smooth and fluffly. Add sugar and flour and beat for an additional 30 seconds. Add egg and beat until incorporated then add eggnog, rum and vanilla extract and nutmeg and mix until incorporated. Pour mix over the crust then place in preheated oven. Bake for 1 hour until the top is set but the center will still jiggle a bit. Cool on a rack for 10 minutes then run a knife around the edge of the pan to loosen cheesecake. Allow to cool until it’s room temperature then place in refrigerator overnight. When ready to served top with whipped cream and a pinch of nutmeg. Recipe adapted from Tastes of Home. Looks so good, I just have to try it !!!!!!!! Do you have to use a spring form pan? Cheryl it is best, you can use another cake pan but it will be difficult to remove from the pan and will most likely break apart when you try to remove a slice. I’m thinking a graham cracker piecrust??? 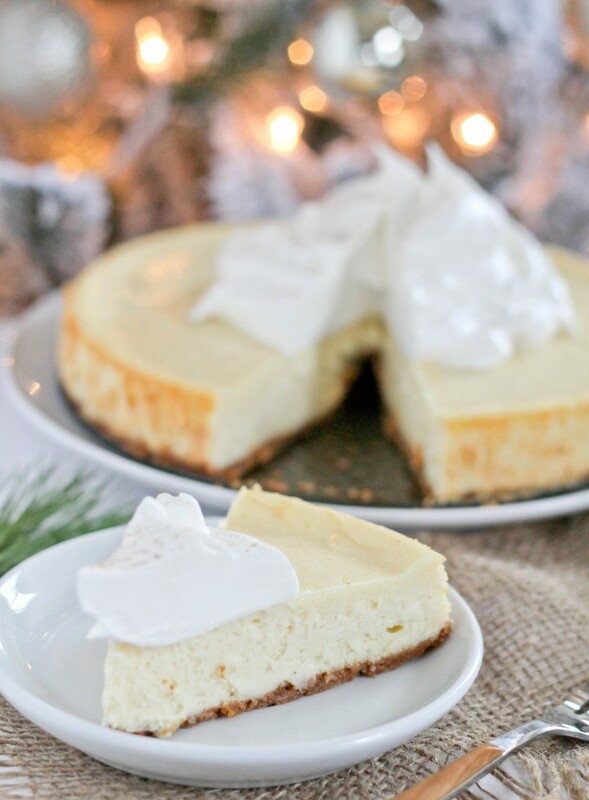 I’m thinking of making mini cheesecakes from this amazing recipe..would work? Oh that cheesecake looks so delicious.